The sun shone this weekend which made excellent conditions for supporting but challenged many of the runners, especially those competing at longer distances. We’re just not used to such lovely weather! Whilst lots of our athletes were taking part in the Shettleston 10k as part of our Summer League (covered elsewhere), there was also racing elsewhere from 3k to marathon distance. Euan Geddes had an outstanding run at Edinburgh Marathon to finish 8th overall (out of over 6,000) and 1st MV45 in 2:39:29. 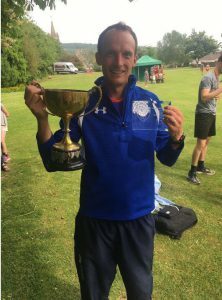 Stephen Porteous traveled South to bring home the win the hot and hilly Kirkcudbright Half Marathon – yet another strong performance from Stevie! Lesley Chisholm also took another 1st F place at the local, monthly 3K on the Green. It was another 1st Female place for Lesley Chisholm in 10:17 and Mary Senior was hot on her heels in 5th place in 11:37. Stephen Porteous won the race in 1:20:09, following int he footsteps of Alex Chalmers who has also had success at this scenic race.